Physics laws shape the world we live in. Most of the observations we make, how we function as organisms as well as practically all biological processes are, in effect, tuned in harmony with these universal forces. There’s no escaping them and today’s most successful species have learned to use them to their advantage. In financial markets too, there are underlying forces an investor or trader has to know and needs to respect in order to be successful. This article series aims at exposing the underlying forces driving market dynamics while detaching them from their protruding visible consequences that are way better known to traders. » In the previous article we showed how gravity and capacity are two of financial markets’ strong underlying forces. In this article we’ll elaborate on the powerful law of nature in the financial markets, how it appears in different spots in their dynamics, effecting participants and what markets keep in store for them. 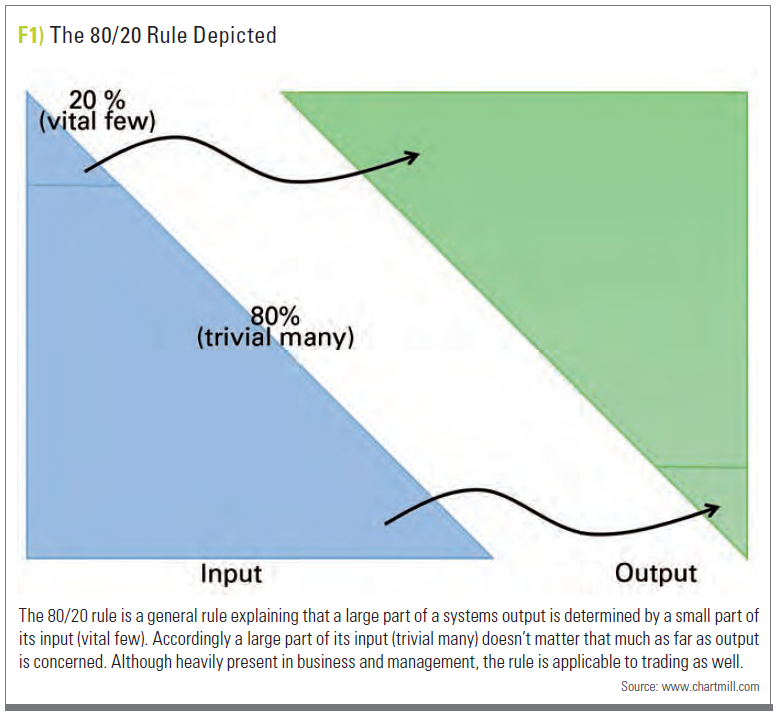 Most people are familiar with the 80-20 rule, also named the Pareto principle or Juran’s principle, known furthermore as the law of the vital few (and trivial many), sometimes described as factor sparcity. This rule, although more an empirical observation than a true law of nature, states that roughly 80 per cent of effects (output) come from 20 per cent of the causes (input), as depicted in Figure 1. Nowadays it’s even common to see it pop up under denominators such as power laws (giving rise to Pareto type distributions), long tail economics with a lot of attention towards areas like rupture dynamics. We won’t go there in this article. 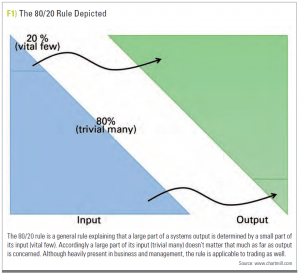 Although the numbers 80 and 20 are used, in trying to grasp the main point, one shouldn’t focus on them for two reasons. First of all, they don’t have to be exactly 80 and 20, they can be numbers describing minority versus majority. Secondly, they don’t have to add up to a hundred, even though they are expressing percentages. The reason for that being they describe totally different things. So this commonly observed effect might show itself as 17 per cent of causes accounting for 91 per cent of the effects (91 and 17 not adding up to a neat 100). What this rule is actually saying is that most things in life aren’t distributed evenly. As a consequence not all efforts have the same or even proportional impact on the outcome of what it is we try to achieve (return in the case of trading). focusing on the critical 20 per cent is a time and energy saver. See what activities generate the most results and give them your appropriate attention. of the market. In this article we want to zoom in on how 80- 20 can make a difference for the individual trader. can never get bigger than five per cent). be profitable in the long run, profitable traders will on average have few large winners (the vital few) and lots of small losses (the trivial many). There you have it, 80-20 in one’s trades. But it doesn’t stop there. If we take this a bit further, 20 per cent of ones trades will also represent 80 per cent of one’s profits. 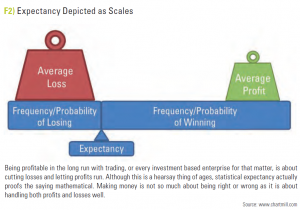 on average 20 per cent of traders gets away with 80 per cent of the money on a lager time scale. Take a look at Figure 3. If we wonder how getting from zero per cent losers towards 100 per cent relates to the effort to get there, some things are pretty obvious. First, no one can have 100 per cent winners, for that would implicate that someone being able to see the future. If such a system would exist, markets would become obsolete very quickly. Since we can’t get to 100 per cent, the relationship can’t possibly be linear. So even though we don’t know how the relationship looks like, it must be asymptotic to the vertical line at 100 per cent and it must increase towards the right for less effort won’t get us more winners. 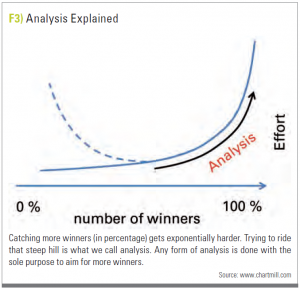 Climbing that slope is what we call analysis, because the sole purpose of any type of analysis is getting us more winners. 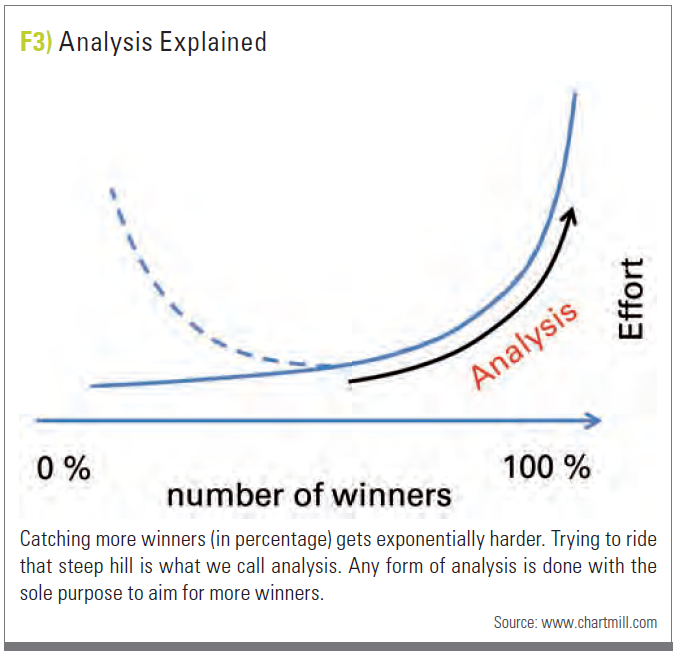 Therefore getting from 30 to 40 per cent winners might take some effort (energy/time/ money for analysis), trying to get from 40 to 50 per cent will cost us several times that effort. This is a power law, showing that, although analysis might not be futile, it obeys a law of diminishing returns. To put this in another way: We probably do way too much analysis. We should focus on 20 per cent of the simplest analysis (like relative strength) which will get us the most value/effect. to be perfect but good enough, the rest can be left to execution. Focus your effort on the 20 per cent that makes a difference, instead of the 80 per cent that doesn’t add much. Again with caution we can start to wonder if 20 per cent of analysts produce 80 per cent of total analysis value. 20 per cent in synch. To separate both phases one could do equity curve analysis on a system. If its equity curve goes down, money is taken away from the system but it keeps paper trading while being monitored. If its (now paper) equity curve starts going up, the system is put back on live trading modus. As far as a portfolio is concerned, lots of research is done and it would takes us way to far even just by giving an overview here. But a great place to start would be comparing what is called the Pareto efficient frontier with the efficient frontier in modern portfolio theory.